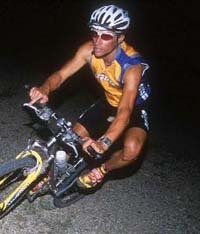 Wie der ehemalige MTB- und Triathlonprofi und derzeitiger Hauptkampfrichter der WTC, Jimmy Riccitello (Encinitas, Cal.) nach Rückversicherung durch Olaf Sabatschus (International Triathlon Professionals ) mitteilen läßt sind alle Helme erlaubt, die das ITU-Regelwerk* berücksichtigen, da dieses im Zweifelsfall Vorrang vor dem Recht eines nationalen Verbandes (hier USA Triathlon) hat. Somit sind Helme nach europäischer CE-Norm genehmigt und die diesbezügliche News hinfällig. Ob damit die Helmfrage dauerhaft für alle US-Rennen geklärt ist oder nur für den Ironman Hawaii und andere Rennen der WTC in den USA wird die WTC hoffentlich in einer offiziellen Presseerklärung am Donnerstag beantworten. d) If a competitor moves the bicycle off the course through disorientation, or for reasons of safety, or the need to carry out mechanical repairs or conduct personal toilet the competitor may not unfasten or remove the helmet from the head until after he/she has moved outside the boundary of the bicycle course route and has dismounted the bicycle; and he/she must fasten the helmet securely on the head before returning onto the bicycle course route or before remounting the bicycle.